Architects Herzog & de Meuron have positioned a scaly crown over the top of this Basel museum (photographs by Roland Halbe). The renovated Museum der Kulturen reopened in September and exhibits ethnographic artefacts and images from around the world. The architects added a new gallery floor to the building, beneath the irregularly folded roof of shimmering ceramic tiles. A steel framework supports the roof, creating a column-free exhibition area. On the existing storeys the architects extended a selection of windows down to ankle-height and removed a floor to create a new double-height gallery. The entrance to the museum is relocated to the rear, where a courtyard slopes downs to lead visitors inside. Dezeen visited Basel back in October and talked to Herzog & de Meuron partner Christine Binswanger about the recently opened museum - listen to the podcast here. Click here to see more stories about Herzog & de Meuron. The Museum der Kulturen Basel goes back to the middle of the nineteenth century. Replacing the Augustinian monastery on the Münsterhügel, the classicist building by architect Melchior Berri opened in 1849. The “Universal Museum,” as it was then called, was the city's first museum building. Designed to house both the sciences and the arts, it now holds one of the most important ethnographic collections in Europe thanks largely to continuing gifts and bequests. In 1917, with holdings of some 40,000 objects, an extension by architects Vischer & Söhne was added. A second extension was projected in 2001 to accommodate what had, by now, become holdings of some 300,000 objects. Modifications would include an entrance especially for the Museum, thereby giving it a new identity. Extending the building horizontally would have meant decreasing the size of the courtyard, the Schürhof. Instead the Vischer building of 1917 has been given a new roof. 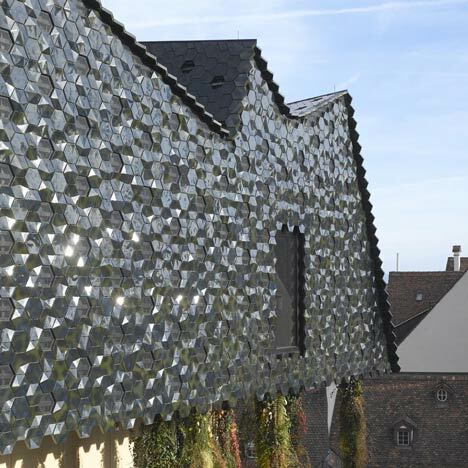 Consisting of irregular folds clad in blackish green ceramic tiles, the roof resonates with the medieval roofscape in which it is embedded while functioning at the same time as a clear sign of renewal in the heart of the neighbourhood. The hexagonal tiles, some of them three-dimensional, refract the light even when the skies are overcast, creating an effect much like that of the finely structured brick tiles on the roofs of the old town. The steel framework of the folded roof allows for a column-free gallery underneath, an expressive space that forms a surprising contrast to the quiet, right-angled galleries on the floors below. Up until now, the Museum der Kulturen and the Naturhistorisches Museum shared the same entrance on Augustinergasse. The former is now accessed directly from Münsterplatz through the previously inaccessible rear courtyard, the Schürhof. The courtyard, in its patchwork setting of the backs of medieval buildings, has now become an extension of the Münsterplatz. Part of the courtyard has been lowered and an expansive, gently inclined staircase leads down to the Museum entrance. Hanging plants and climbing vines lend the courtyard a distinctive atmosphere and, in concert with the roof, they give the Museum a new identity. We look forward to having the courtyard become a social meeting place for all kinds of Museum activities and celebrations. The weighty, introverted impression of the building, initially concealing its invaluable contents, is reinforced by the façades, many of whose windows have been closed off, and by the spiral-shaped construction for the hanging vegetation mounted under the eaves of the cantilevered roof above the new gallery. This is countered, however, by the foundation, which is slit open the entire length of the building and welcomes visitors to come in. These architectural interventions together with the vegetation divide the long, angular and uniform Vischer building of 1917 into distinct sections. The white stairs, the roof overhang, the climbing plants, the series of windows in the “piano nobile” and the glazed base lend the courtyard direction and give the building a face. The windows were closed up not just to enhance the weight and elegance of the building; the additional wall space provided by this measure was equally important. The few remaining openings have been enlarged and now extend to the floor. The window reveals are so deep that they form small alcoves that look out onto the old town. The sequence of rooms follows the same pattern on all three gallery floors. Only two rooms stand out: on the second floor, directly above the entrance, a large room with windows on one side faces the courtyard. Further up, a ceiling has been removed, creating a two-story room with a narrow window slit, where larger objects in the collection can be displayed. Visitors can look down on this new anchor room from above, much like the room containing the Abelam House, thus also providing orientation within the Museum. The renovation of the galleries followed similar principles throughout. The older rooms have classicist coffered ceilings; those added later have concrete beams in one direction only. With the goal of restoring the original structure of the rooms, dropped ceilings were removed and technical services integrated as discreetly as possible into existing architectural elements.